In Alone on the Wall, author and free solo climbing phenomenon Alex Honnold with veteran climber and mountaineering author David Roberts, make a game attempt at doing the impossible: capturing the full visceral impact of climbing massive rock walls at dizzying heights using nothing but fingers, toes, and a bag of chalk to aid the grip with nothing but air and certain death below. Honnold, now 30, is best known for being the preeminent free solo climber in the world in which the climber scales the cliffs alone without the aid of ropes, harness, or safety gear of any kind. At the time of the writing, he has completed an array of seven astonishing climbing experiences including a free solo climb of the Sendero Luminoso in Mexico, climbing the Fitz Traverse in Patagonia, as well as the only solo climb of the Yosemite Triple Crown. The book takes two very different paths. The first describes Alex Honnold, the person, and the second is trying to capture what he does, which is an experience that is not only completely foreign to at least 99.99% of the world’s population, but also prompts most people to ask, “You do what?” when meeting him for the first time. The first task is done rather well as Honnold’s narrative describes his genuine passion for the climbing while revealing a personal humility that paints a clear and vivid picture of a likeable and unassuming, introspective young man. And unlike many historical adventurers who drive themselves and their companions through a visible burning intensity to achieve, Honnold is the antithesis of that. He is an amazing mix of nonchalance and hyperactive toddler who uses his ability to meld an internal calm with an amazing physical strength to thrust himself up the sheer walls he scales. Unfortunately, the second task of the book, describing what Honnold does during those remarkable climbs is simply too difficult as there is just too much of a stark contrast between writing about his free solo climbs with the reality of those climbs to be effectively captured on paper. There is one notable example. Honnold describes a time when, 750 feet up on the Rainbow Wall climb, he had to either climb back down to find another route or use a ”tiny divot, a natural hole in the stone” to keep climbing. He matter-of-factly describes using the divot, which allowed only about one third of the first digit of his left index finger and then “stacking” his middle finger and thumb over that digit to pull his full weight up so he could grab another hold to keep climbing. The reader needs to take a moment to fully comprehend what was just described. Alex used that tiny hold, without the existence of a net or rope, while perched 750 feet in the air, to put his full weight on the grip to keep moving up a cliff. The photos accompanying the narrative do help to bring the climbs into better focus, but the words falter when bumped up against the visuals, especially for those who have also viewed several award-winning documentaries featuring Honnold’s heart-stopping climbing accomplishments. 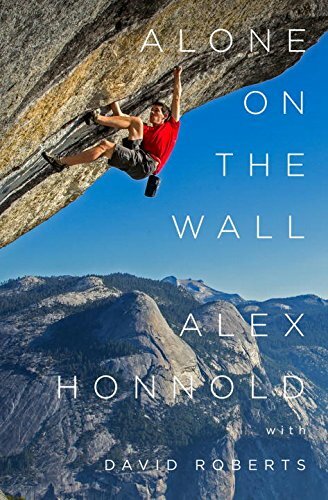 In this case, perhaps seeing the documentaries prior to reading the book will allow the reader a better way to fully appreciate what it is that Alex Honnold does after he sets his sights on a climb. Russell P. Gantos Jr. has been a researcher for more than 40 years as well as a journalist and newspaper sports editor and columnist. He has a degree in journalism from Ohio University.